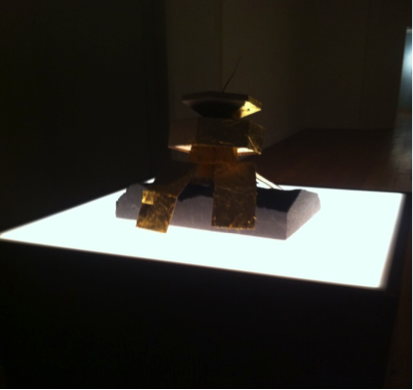 The Galway Arts Centre hosted the exhibition Beyond Other Voices by Ciarán Walsh from the 3rd to the 31st of October, 2014. The exhibition was divided into two galleries: one and two respectively. Gallery One was situated on the ground floor and was divided into two sections: the front and the back. Gallery Two was set up on the second floor and it too, was divided into two sections. Walsh is an Irish artist who has previously been involved in solo exhibitions at Pallas Projects and the Four Gallery in Dublin and at VISUAL in his native Carlow. The exhibition reveals Walsh’s committed exploration of personal and collective memory and the allegorical structures of science-fiction. For the purpose of this assignment, we will look at one work from Walsh’s I Grabbed at a Pile of Dust (2014), located in Gallery One. 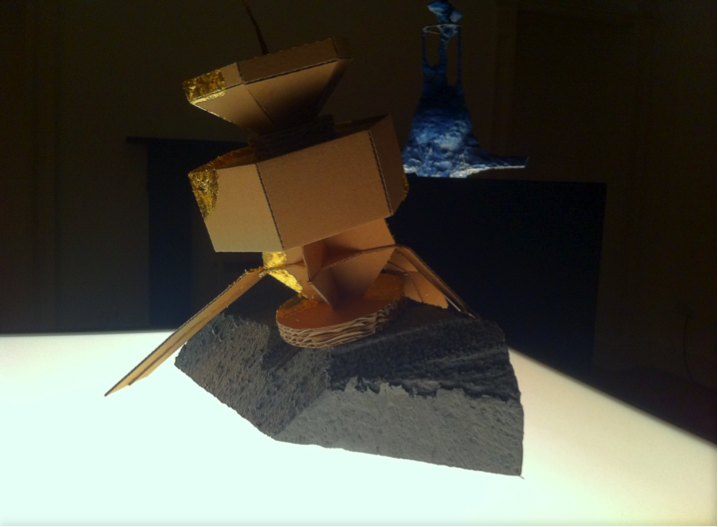 Close-up of one of the two model constructions which make up ‘I Grabbed at a Pile of Dust’ by Ciarán Walsh. The structure of this particular piece resembles that of technology used for earthly communication with extra-terrestrial life. The series itself includes two pieces of model construction. As I have already stated, the theme of memory and imagination pervades much of Walsh’s work. The model constructions in this series are rendered from memories of spaceships, satellites and space colonies depicted in the speculative scientific books and science-fiction films from Walsh’s youth. In this way, Walsh’s artwork has distinctiveness and a personal identity. When you write fiction, you write what you know, drawing on past experiences, drawing on memory. Walsh is no different as an artist. His fascination and preoccupation with technology and indeed interplanetary life and travel is evident in the series. The piece is imbued with the curiosity and innocence of a child. The form of the piece is quite simple and childlike, a purposeful trait. It is three-dimensional. Walsh utilises easy to find, household items to construct his piece. These include: cardboard, a gold leaf, Styrofoam, spray paint and slit-drape curtain. The piece is roughly constructed and imperfect. It is a product of Walsh’s youthful visualisation and interest. The bland colour of the satellite (cardboard structure) is intended to mark a place in time, a time when life on earth will cease. The rock (Styrofoam) on which the satellite is planted is dark and rigid, symbolising the barren state of a post-apocalyptic earth. To emulsify this notion of a need for interplanetary travel, Walsh mashes a tattered gold leaf into the side of the satellite’s panels to signify the destruction of nature. The dish at the top of the satellite contains an aerial, signalling to outer space for assistance. It was an intriguing and stimulating experience to spend an afternoon looking at Walsh’s exhibition. There is a childlike intelligence about the series, one which draws the spectator closer to investigate what might be at work. The room in which the piece was displayed had little lighting. This was surely a conscious artistic decision, concealing the meaning of the piece even further.